The standard Accuflow system is our main design and the most utilized. It covers low to high production flow rates as well as light to heavy crudes. It provides the most ability to separate gas and liquid. The footprint size can vary from application to application. We have the full SR version for the higher production flow rates and our more compact LT version for the lower to medium flows. Every Accuflow skid is custom designed to meet your process measurement flow conditions. When testing in high water cut situations, the Accuflow 3 Phase System is the ideal solution. Determining the net oil out of the relatively high water content can be more challenging; by separating the water phase from the oil phase, the measurement instruments are given the best chance at flow measurement and increasing your Net Oil accuracy. The Accuflow JR is our low flow model. Specifically designed for lower flow rates and light oil, this system can be a very economical solution for your measurement needs. Properly engineered, this design does not require the use of any control valves. A vertical section of pipe for gas/liquid separation and a few measurement instruments is all that is required. 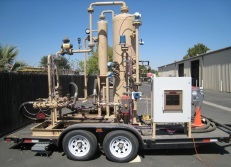 In addition to our unique Accuflow designs, we also design and manufacture conventional test separators: vertical separators, horizontal separators, heater treaters, free-water knockouts (FWKOs), etc. Contact us for more information. Although Accuflows come close to fiscal-level accuracy, they are mainly meant for allocation purposes. For fiscal-level accuracy, traditional LACT units are available. 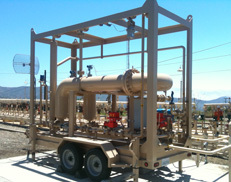 Contact us for more information about our LACT units. 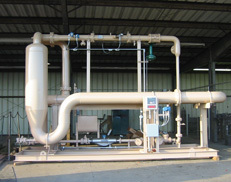 We also offer custom process piping solutions, such as water/steam injection skids, flow loops, etc. If you have an idea/need, we can size and select instrumentation and fabricate the needed pipe spools and supports to make it happen. Contact us for more information. The Accuflow Multiphase Metering System utilizes a simple yet innovative methodology to separate gas from liquid for 2 Phase measurement. The main principle of the Accuflow is to effectively separate the free gas from the liquid phase and to measure each phase independently. With complete separation, the measurement equipment used in each phase can be utilized to their maximum effectiveness and potential. The separation of gas and liquid occurs in the Accuflow in 2 stages. Stage 1, the liquid enters a vertical pipe at a downward tangential angle creating a cyclonic action in the pipe. This cyclonic action pushes the liquid towards the pipe wall and enables the majority of the gas to release to the center of the pipe and travel up to the gas run. The liquid with some remaining gas is carried into a secondary stage of separation. In the 2nd stage of separation, the liquid with remaining gas flows along a horizontal section of pipe. 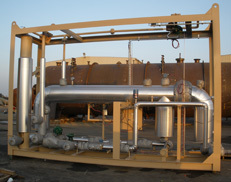 The liquid level in the horizontal pipe is controlled in the middle of the pipe. The liquid level is controlled by a liquid level sensor in the horizontal pipe and a control valve in the gas run. As the liquid level rises in the horizontal pipe, the level sensor sends a signal to the control valve and which begins to pinch shut to create some slight back pressure to push the liquid level down. Conversely, as liquid level goes goes down, the control valve beings to open to relieve pressure to allow the liquid level to rise. In essence, the control valve modulates to maintain the liquid level in the middle of the horizontal pipe. With a large gas/liquid interface area, thin gas-bearing emulsion layer and quiescent flow in the horizontal pipe, all contribute to the final removal of free gas bubbles from the liquid stream. 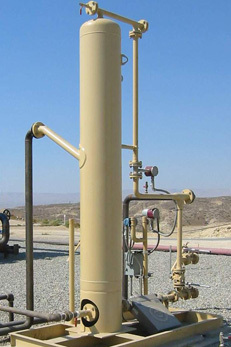 All of the free gas removed in the horizontal section joins the gas run through a connecting run and is measured in the gas leg. The liquid, now free of gas drops to a liquid run for measurement. In the liquid run, Coriolis metering technology is typically employed for flow measurement. Water cut can be determined by either Net Oil Computer (density method) or through a separate water cut meter. The gas is typically measured with ultrasonic, vortex, or Coriolis technology. All technologies used in the Accuflow are already currently practiced and approved by all major oil companies. After measurement the gas and liquid streams are recombined and returned to the production line.